After a long winter are you beginning to feel spring fever coming on? Kids are anxious to be outside, moms are anxious for the homeschool year to be drawing to a close. Spring is the season when we are all hoping to finish lessons as we look forward to summer break. But, it’s also the best time to be planning for next year. 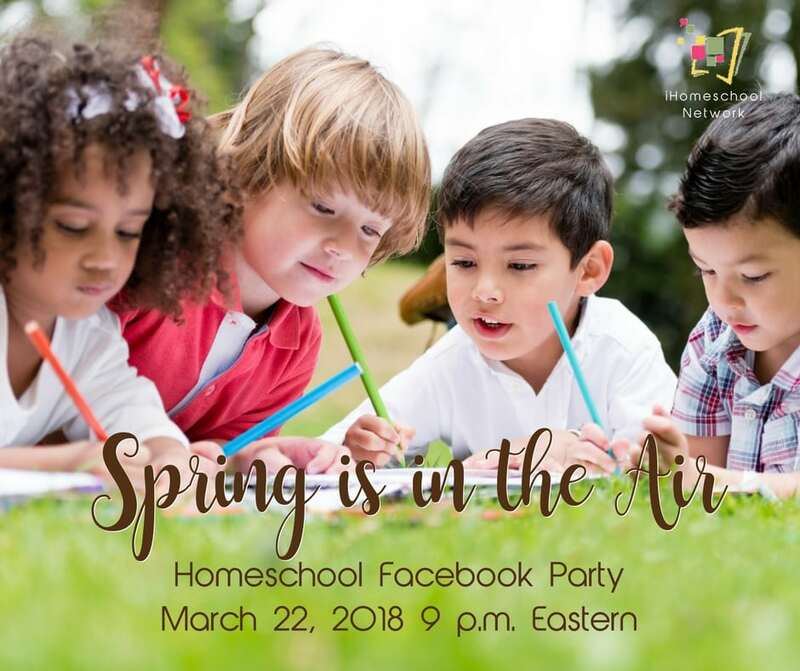 Spring is in the Air and iHomeschool Network’s Homeschool Facebook Party gives you an opportunity to learn about products and services which can provide solutions for your homeschooling needs. Chat with other homeschooling parents, get discounts and freebies, and be eligible to win prizes. 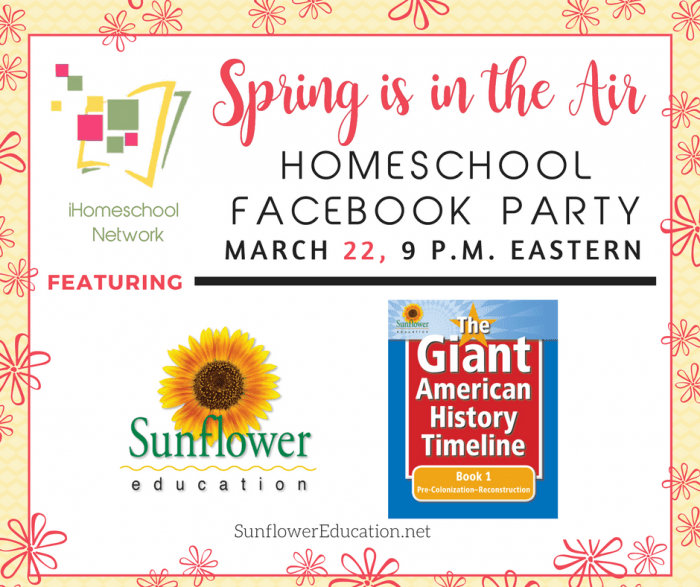 Our Facebook party is an online social gathering of homeschool parents get together on Facebook to chat about homeschooling. You’ll have a chance to learn about products and services available to the homeschooling community. And it’s fun because our featured sponsors bring freebies and prizes to share with attendees. 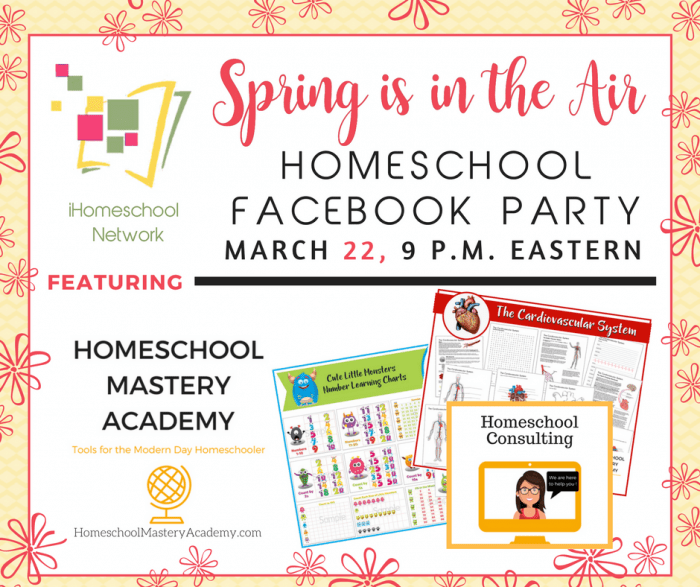 Who Attends a Homeschool Facebook Party? Homeschooling parents, friends, bloggers, and others who are interested in learning more about or contributing to homeschooling conversations. You are invited to join iHomeschool Network and our featured sponsors. Simply share this page or image on Facebook, Twitter, G+, Pinterest, Instagram or your FAVORITE social media network. 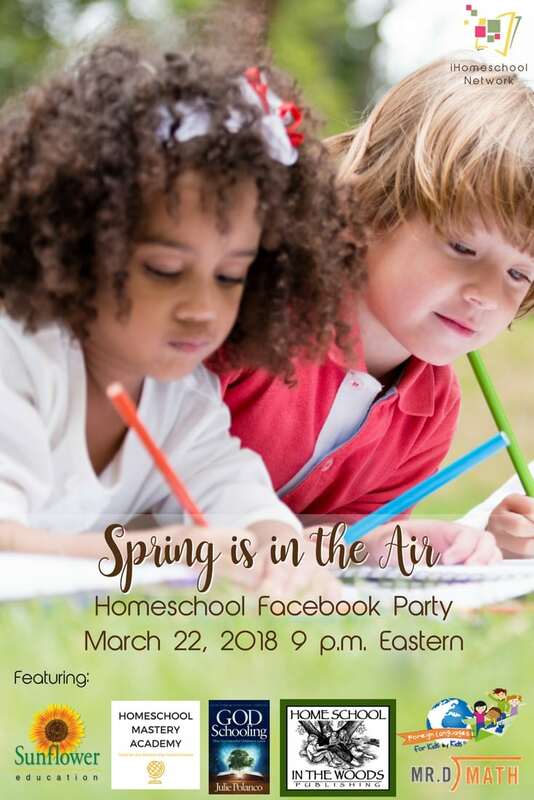 When is the Homeschool Facebook Party? We all know and love Homeschool in the Woods for their fantastic unit studies, and lapbook products. They’ll be joining us for the Homeschool Facebook party to introduce a new product: À La Carte Projects, offering you an affordable way to develop your own unique curriculum with hands on projects, educational games, creative writing assignments and much more. 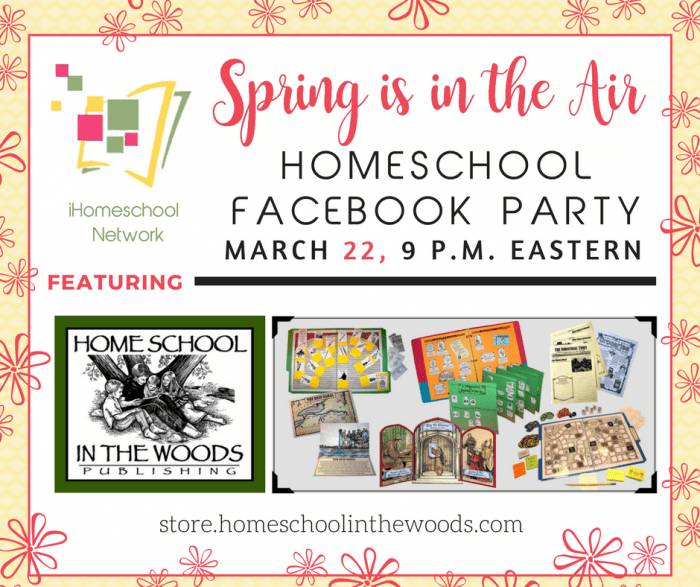 Homeschool in the Woods – Follow on Facebook. 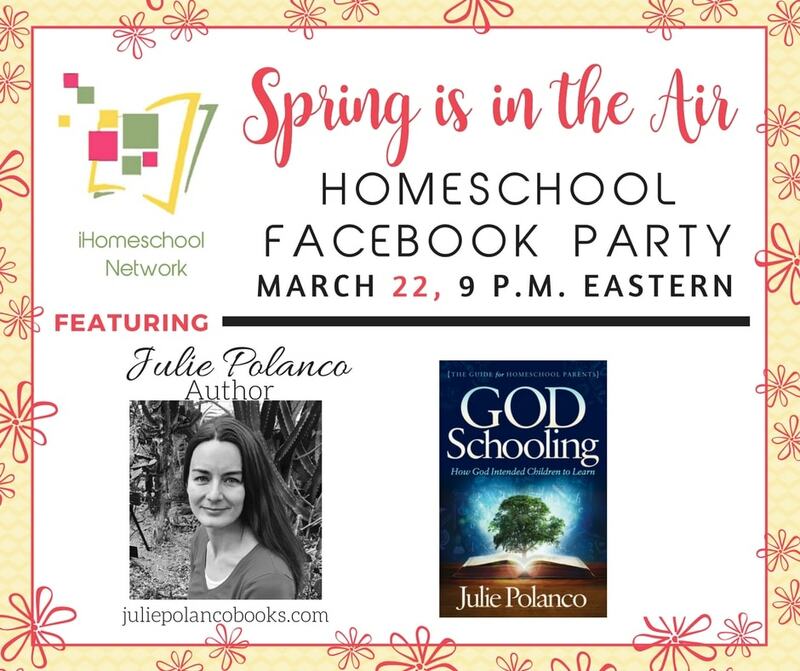 We’re thrilled to introduce you to Julie Polanco’s, Author, newest book, God Schooling. 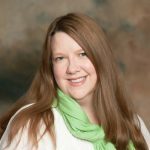 In it, she tackles many of the homeschooling myths and puts homeschooling into perspective. She helps parents learn how God intended children to grow and develop at every stage. Through chapters specifically devoted to each stage of development, parents learn the true needs and best teaching methods for every child. God Schooling – Follow on Facebook. We all know the importance of teaching a foreign language. But so often we get stuck trying to figure out how to teach a foreign language when we don’t understand it ourselves. That’s where Foreign Languages for Kids by Kids® can help. Recommended by Cathy Duffy and winner of numerous top educational and homeschool awards this dynamic program allows students to learn Spanish while working independently or alongside their parent/teacher. The best part is parents do not have to know any Spanish! Foreign Languages for Kids by Kids® – Follow on Facebook. We are thrilled to introduce you to Homeschool Mastery Academy. Their experts are able to help you to be an organized, effective homeschooler by inspiring a love of learning. They can help you to build a homeschooling system that’s right for your family. Their courses, webinars, blog posts and coaching services are designed to help you create the perfect fit. Do you need great curriculum that you can use today? Their printables and resources are available for instant download and can simplify your life and reduce your lesson-preparation time. No matter what style or method you prefer, or whether you’re a new or experienced homeschooler, Homeschool Mastery Academy is your resource for simple, actionable homeschool improvement. Homeschool Mastery Academy – Follow on Facebook. Helping students to put history into perspective allows them to have a better understanding of how it all fits together and leads to their own lives today. Sunflower Education’s Giant American History Timeline allows kids to build a visual understanding of American history. As students’ knowledge grows, so do their Giant Timelines. The result is a gorgeous and satisfying project that showcases their accomplishments and gives them an ongoing review of American history. Sunflower Education – Follow on Facebook. Mr. D Live classes, curriculum, and co-ops are unlike anything you’ve ever experienced. Most programs give you a workbook and leave you to figure it out on your own. Students (and parents) have a built in teaching partner through our unique set up and hands on interaction. Using simple technology, they provide an online video format that allows students and parents to review lessons at home as well as in the classroom, but will continue to use examples and solutions that are handwritten, and the students watch the teacher’s hand doing the writing! Mr. D Math – Follow on Facebook. It’s really easy to join the fun, but there are a couple of things you need to do before the party begins. Make sure you have liked the iHomeschool Network Facebook page and are following to receive all notifications. Check on the page, you will see LIKED if you are a fan already. If it says LIKE, simply click on the “Like” button on the widget. Also, be sure you are receiving our notifications in your news feed, please also go to our Facebook Page, click the drop button beside the LIKED button and select Notifications All On so that you will see all the party related posts in your newsfeed. This way you won’t miss the questions being asked. (See the image below). 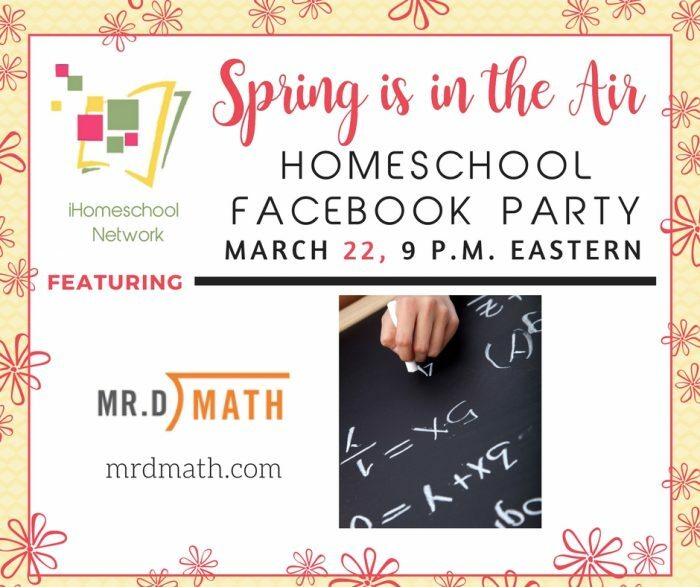 You may RSVP to the party on the Spring Homeschool Facebook Event Page. Simply go to the party page, and click Going. We will share regular reminders and updates leading up to the event. On the night of the party, March 22, at 9:00 p.m. Eastern, simply watch your newsfeed for party prompts. Or, you can go to the iHomeschool Network Facebook Page and participate as prompts are posted. You’ll need to refresh often so you don’t miss a thing, but don’t worry, we’ll remind you to do so. 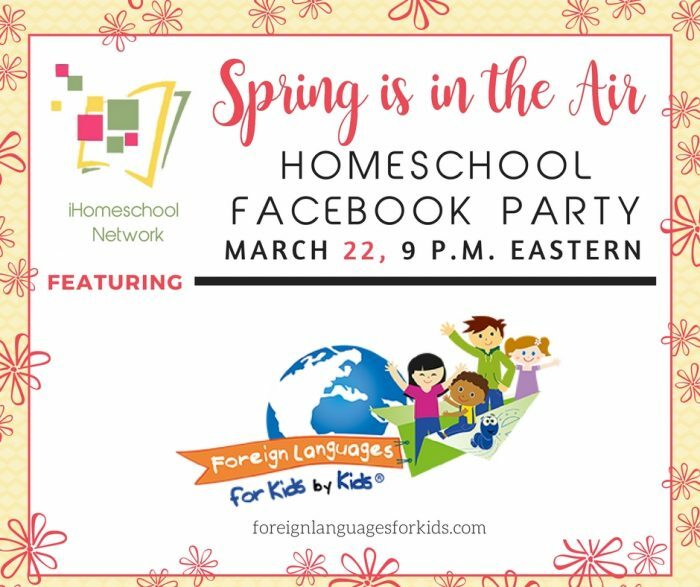 We look forward to seeing you at our Spring Homeschool Facebook Party! It will be a fun-filled evening full of chat, freebies, and prizes! It will be even more fun when you share the experience. Be sure to tell your friends so they can join the party too!